Always A Prince and Custom Cantab topped the list of Indiana champions honored in Indianapolis. The Indiana racing community celebrated the top performers of 2018 on Saturday (Jan. 26) in ceremonies held in downtown Indianapolis. 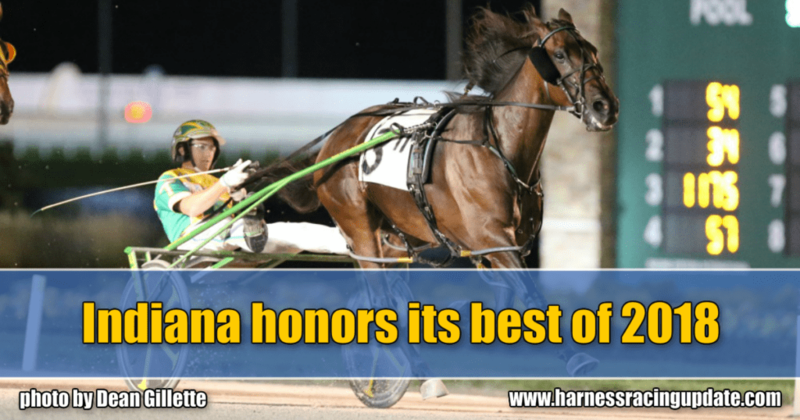 Always A Prince and Custom Cantab were named the top pacer and trotter in the state, respectively, while Trace Tetrick and Jeff Cullipher were honored as the leading driver and trainer in Indiana last season. Jack Kieninger, outgoing Indiana Standardbred Association president, was one of three inductees into the Indiana Standardbred Hall of Fame. Always A Prince did not compete as a 2-year-old, but he became a star last summer at Harrah’s Hoosier Park, earning him honors as Pacer of the Year. The Always A Virgin—Glorious Princess gelding won 19 of his 22 sophomore starts, including seven straight to begin the year. Developed by the late Jim Dailey for owners Carl and Melanie Atley, Always A Prince raced almost exclusively in Indiana, capturing the $155,000 Jenna’s Beach Boy, $220,000 Indiana Sires Stakes Super Final for three-year-old colts, $36,750 Pegasus, and was placed first by judges in the $190,000 Monument Circle. Bred by Emerald Highlands Farm, he finished the season with $492,875 in earnings and a mark of 1:48.3. Indiana-sired Custom Cantab enjoyed an equally impressive 2018 campaign to secure Trotter of the Year accolades. The Mr Cantab—Custom Model filly finished the season with a 13-3-1 record over 17 starts for trainer and co-owner Chris Beaver. She would claim victory in the $220,000 Indiana Sires Stakes Super Final for sophomore trotting fillies, as well as the $183,900 Matron final, $137,000 Crossroads of America and a $26,500 Pegasus. Custom Cantab trotted second in the $172,000 Moni Maker and a $28,600 Circle City division. Owned by Beaver, Donald Robinson and R.B.H. Ventures Inc., the filly banked $521,400 for her connections. Over two seasons she has accumulated $735,886. Breeders Crown champion Homicide Hunter, that fastest trotter in the history of harness racing, was named Aged Trotter of the Year, while Rockin Ron was designated Aged Pacer of the Year. Dr. Patrick Graham, Homicide Hunter’s breeders and previous owner, was named Small Breeder of the Year. Victory Hill Farm Inc. took home Large Breeder of the Year honors, while Always A Virgin and Swan For All, stallions standing at Victory Hill, earned the distinctions of Pacing Sire of the Year and Trotting Sire of the Year. Tetrick was once again the toast of the driving colony at Hoosier Park in 2018. He registered 309 wins and purse earnings exceeding $3.7 million over the course of 160 programs. Those totals earned Tetrick his seventh Hoosier Park title, and fifth consecutive, as well as Pari-Mutuel Driver of the Year. Cullipher was selected Pari-Mutuel Trainer of the Year after sending out 119 winners at Hoosier Park last season. He picked up his second leading trainer title at the track. His first came in 2017 when he tied for the title with fellow trainer Jamie Macomber. Don Eash and his Eash Racing Stable have been a perennial powerhouse on the Indiana fair circuit, and he was again recognized as the top driver and trainer. He accumulated more wins in each category last season than any other horsemen competing on the summer-long circuit. The Indiana Standardbred Hall of Fame added a trio of new inductees: Kieninger, former Indiana lawmaker Luke Kenley and former Indiana Sires Stakes champion Foxy Maneuver. Kieninger has served Indiana’s racing industry in many ways, most recently at the helm of the ISA for multiple terms. Besides being named to the Hall of Fame, he also received the ISA President’s Award and the Sagamore of the Wabash, one of the state’s highest honors. Kenley served in the Indiana Senate for a quarter century before his retirement in 2017. He was instrumental in shaping the state budget, and was equally critical in supporting the interests of Indiana’s horse racing and breeding industry. His involvement helped preserve funding for racing and set the industry on firm footing to grow into what it has become today. In the early to mid-2000s, free-for-all pacer Foxy Maneuver was one of Indiana’s most recognized products. Trained and driven by Eash, “Foxy” secured Indiana Sires Stakes finals at ages three, four and seven, and finished second on two other occasions. The Armbro Maneuver—Foxy Dragon gelding earned $130,000 or more in five straight seasons on his way to accumulating $878,875, making him one of the richest Indiana-sired pacers at the time of his retirement. Bred by Lynn Wilfong, Foxy Maneuver took his 1:49.3 mark at age five. Large Breeder of the Year: Victory Hill Farm, Inc.